I love me some Cafe Rio! 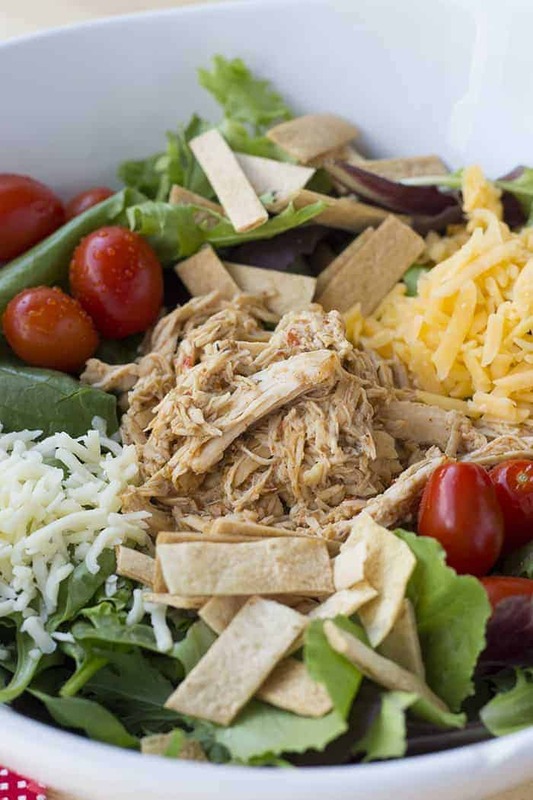 Their pulled pork salads…divine!! Or a steak-stuffed burrito smothered in creamy sauce? YES PLEASE!!! Our local Cafe Rio isn’t very far away, but I don’t always have time to go pick up food. And because they are so popular, the line to wait is often quite long, especially near peak dinner time. Enter your make-head freezer meal! This is another “dump-and-go” meal. There is NO prep and NO pre-cooking involved! None!! I’m not sure it gets much easier than this, which is another reason why I love this meal! You can use Zesty Italian dressing in this one, if you’ve got it. I was all out, so I used regular Italian this time, and it turned out great! And this is another great use for your homemade ranch dressing mix! There really isn’t much to tell on this one. 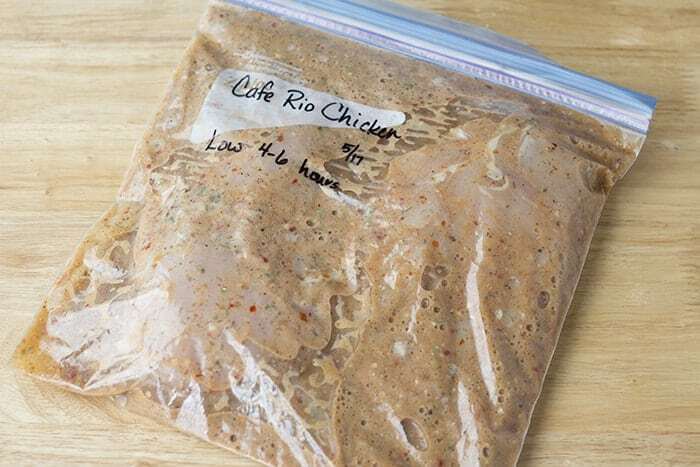 Place your chicken in a labeled gallon-size freezer bag, then pour in the rest of the ingredients. Squeeze out as much air as you can, and seal the bag, making sure it is tightly closed. Squish it around in your hands to mix up all the ingredients. Lay the bag flat in your freezer to freeze (if possible, otherwise it will freeze into a weird shape and be hard to stack). To cook, remove the bag from the freezer and allow it to thaw overnight in the refrigerator. 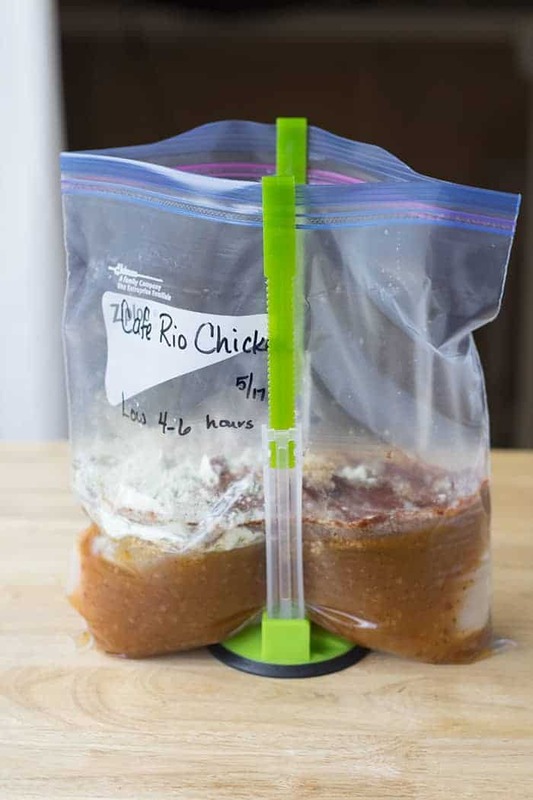 However, most of the time I forget this step, and only think about the morning of, so I pull out the frozen bag, cut the plastic bag off, and put the whole frozen block in the slow cooker and turn it on. Whatever works, right? Cook on low in your slow cooker for 4-6 hours. When ready to eat and the chicken is cooked through, take two forks and gently shred the chicken. You can take it out and shred it on a cutting board, and then return it to the slow cooker and mix with the sauce, or you can shred it carefully right in the slow cooker. I usually just shred it right there in the slow cooker. For the InstantPot, pour thawed contents of bag into pressure cooker, close lid, and set to cook on HIGH pressure for 8 minutes. When timer beeps, quick release pressure. Shred chicken with two forks right there in the pot. If you don’t want all the liquid with your chicken, you can drain some off. I highly recommend trying this on a salad, with creamy cilantro lime ranch dressing! But really, it’s also great in tacos, burritos, quesadillas – you name it! 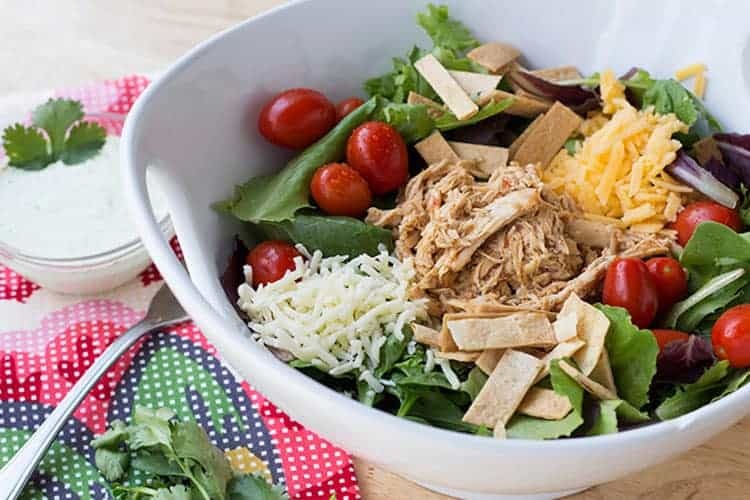 This copycat Cafe Rio Chicken recipe is an easy freezer meal to add to your rotation! It tastes delicious, can be eaten multiple ways, and requires no pre-cooking or prep!! Best of all, it cooks in your slow cooker! Label freezer bag. Place chicken breasts in bag. 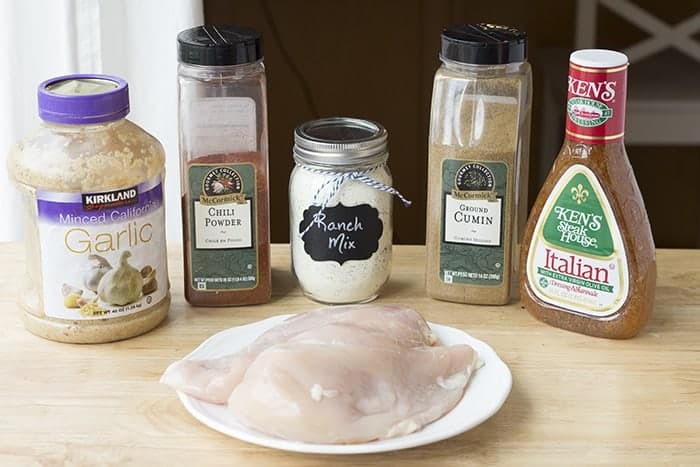 Pour remaining ingredients in on top of chicken breasts. Squeeze out air and tightly seal bag. Knead gently with hands to mix contents of bag. Lay flat to freeze in freezer. Remove bag from freezer and allow to thaw overnight in the refrigerator. Place contents of bag into slow cooker or Instant Pot. Cook on low for 4-6 hours in slow cooker, or on HIGH pressure for 8 minutes in Instant Pot with quick release after. 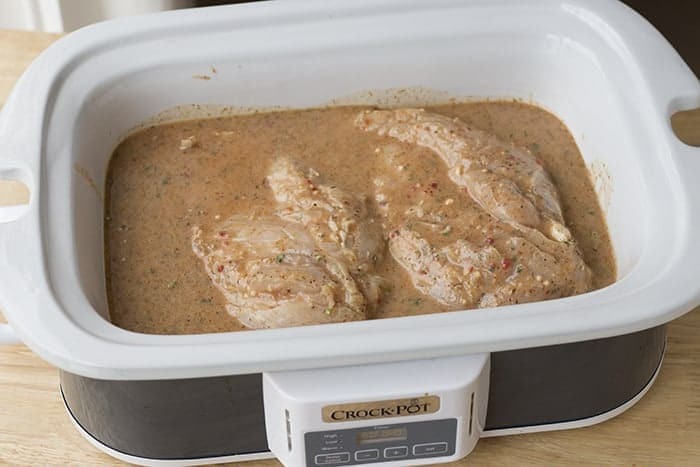 Remove chicken breasts, shred, and return to slow cooker or Instant Pot, mixing it in with the sauce. (Or shred right in the crock or pot.) Drain off some of the cooking liquid if there is more than you want. Serve as desired. It's great on a salad, or in tacos or burritos. This looks delicious! Do you have to start with fresh chicken breast? Or can I put it together with frozen ones? This was yummy and easy!